Cronicl yr Awen: Llanfihangel Genau'r Glyn - what's in a name? Llanfihangel Genau'r Glyn - what's in a name? Some time ago I wrote HERE about the creation of a poetry path in the village of Llanfihangel Genau'r Glyn. Since then the path has been completed and, on 17th May 2012, it was officially opened by Jim Parc Nest, the Archdruid of the Gorsedd of Bards in Wales. The opening was followed by an event in the adjoining church filmed by the Welsh-language TV channel S4C, in which some of the poems were read by their authors and others by their posthumous representatives. These were interspersed by performances from local schoolchildren. At the launch ceremony, the man whose vision created the path, Wynne Melville Jones, spoke of his wish that the event might be a spur to further developments in the revival of the village's full name from the abbreviated form 'Llandre' which dates from the coming of the railway in 1840. Although the railway track still runs through the village, the station has long since been closed but the abbreviated name remains in spite of a campaign which has resulted in the full name being restored in brackets below 'Llandre' on the main road sign for the village. What's in a name? In this case a lot of history as well as the beauty of the words. Literally it means 'The Church of Michael at the Mouth of the Glen'. 'Mouth' (Genau) here is used in the same sense as 'mouth of a river' and means the entrance or pass into a valley. The valley is the Cwm Eleri of my poem on the path. The village has had other names in its history, such as 'Llanfihangel Castell Gwallter', referring to the establishment of a motte and bailey castle in the 12th century by the Norman Walter ('Gwallter' in Welsh) de Bec up on the site of a hill fort above the village. This was destroyed by the locals and now only the earthworks remain. A poem on the path by Huw Ceiriog refers to this and cleverly works into an englyn the Norman word ruelle (which still gives its name to a couple of farms) Walter's 'little road' and a warning that though he has gone the threat he represents still remains. Names, when looked into, are often rich with historical, cultural and geographical resonances. 'Llandre' represents the utility of railway engineers and signwriters. 'Llanfihangel Genau'r Glyn' contains the historical development of a parish, a legend about the building of the church - itself resonant of a possible older religious enclosure dedicated to Brigid (Bride, Ffraid, or the Glanfrêd referred to in my poem), and a name that evokes the geographical location it represents. Which should we prefer? 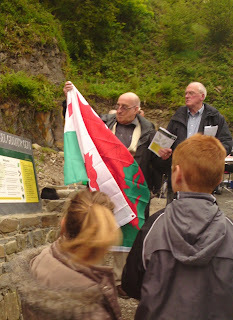 Jim Parc Nest acknowledged the beauty of the longer name in the Welsh language. He also spoke of the Poetry Path (Llwybr Llên) and referred to a poem not on the path which expresses the idea (roughly remembered from his speech and inadequately translated here) that the really significant moments of life are recorded in 'twists and turns on the path of poetry'. Quite so.